Join St. Bernadette Parish for an entertaining, family fun game. The festivities start after the Open House on Feb. 10th (2pm-4pm). For more details, Read more. Once again St. Bernadette’s Annual General Meeting is an evening of community building, dialog, and obtaining important information in regards to tuition, school improvements, funding, election of the Parent Support Group, and much more. Attendance is mandatory for all family. Every family that attends receives an hour towards their parent participation hours. Gr. 7 parents who are sending their child to Holy Cross Secondary are exempt this year due to a conflict with the Holy Cross Open House. Babysitting will be provided. Please see below for more details. On Thursday January 31st, at 7:30pm (immediately following the AGM), St. Bernadette Elementary will be hosting the Sexuality and you Child Presentations for all parents in who have children in grades K-6 (grade 7 parents will have their presentation on a different evening – more information to come). It is sponsored by the Archdioceses and once again attendance is mandatory. The evening is part of the Religious Education and Physical and Health Education (PHE) courses for your child. This night is designed to empower parents to recognize their role as primary educators in faith and truth in human sexuality. Every session has a separate topic for parents and these topics change from year to year. Each session is reviewed and updated each year so you can expect a fresh presentation even if you have attended specific sessions previously. The objective of this evening is for parents to gain confidence in their ability to communicate about sexuality to their children. We will be offering free babysitting to families who need child care during the AGM and S&YC evening. NO DROP INS – REGISTRATION IS A MUST. To register please email the school at admin@stbernadette.ca – please give your name, your child(ren)’s name, and their grade(s). Our annual Open House will be held on Sunday February 10th from 9am – 1pm. We invite you to drop by after mass to tour the school and see what our school has to offer. All ladies are invited for an evening focused on you! Join us Thursday, February 7 at 7:30 p.m. in the Parish Centre for presentations from London Drugs Cosmetics and Pharmacy. Previous presentations included sun aware skincare, choosing a moisturizer, vitamins and supplements, and vaccinations. This evening is sponsored by our CWL and includes refreshments. St. John Paul II Academy is happy to announce they are accepting applications for Gr. 8 & 9 students for the 2019-20 school year. All student applications must be completed by Thurs. Feb. 28, 2019 and returned to Mr. Michel DesLauriers, Principal, 15262 Pacific Ave., White Rock, BC V4B 1P7. You can find the Application Form and more information concerning financial assistance on the school website:www.sjp2academy.com or by contacting the school office. An Information Evening will be held on Wed. Jan. 30th @ 6:30 pm for all interested parents at St. John Paul II Academy. In the event of weather conditions, or unforeseen circumstances, the pastor, chairperson and principal will decide whether or not the school will be open on that day. Notice of school closures will be announced on CKNW 980 on the AM dial and posted on the school website when possible. Please do not call the school; it is important that we keep all lines free in case of an emergency. • Conditions are monitored throughout the night, and again at approximately 6:00am by the Principal. • Temperature and wind chill (for safety of walkers and students at bus stops) – we use a -20 wind chill for a sustained amount of time as a “cold weather closure” guide. • Current weather conditions, along with predicted weather, but closures cannot be determined solely on predictions. As a reminder, although we do our best in the decision-making process, if you the parent feels as though it is not safe for your child to attend school, you have the option of keeping your child at home. All proceeds generated from the sales of used uniforms comes directly back to the school. DO NOT FOLLOW WHERE THE PATH MAY LEAD. 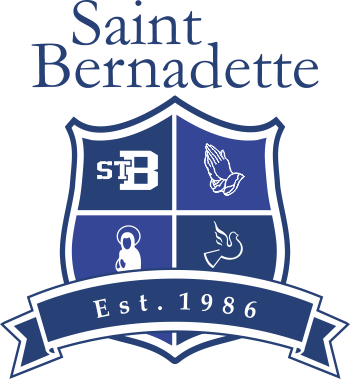 Subscribe to our newsletter to find out the latest St. Bernadette news!